On Tuesday night, while Mayweather was shadow boxing on stage for the cameras, McGregor quipped “dance for me, boy”. 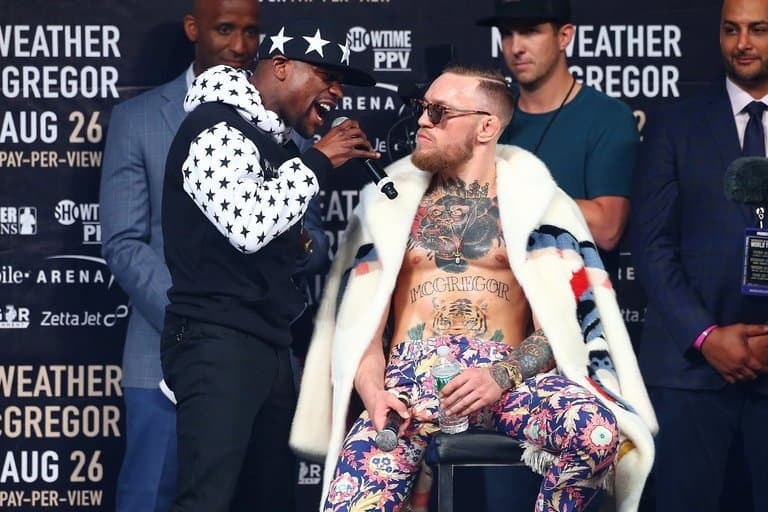 The comment was enough for McGregor to have sensed that he may have inadvertently made a racial faux pas and he quickly repeated the “dance for me” part with “Sir” added to the end of the sentence in place of “Boy”. The UFC lightweight champion was then heard to repeat the remark the following night at the Budweiser stage in Toronto, Canada, sparking a backlash from many who have accused the Irishman of intentionally employing racial undertones in his trash talk. While many have argued that McGregor’s use of the word “Boy” is nothing more than a common term used by the Irish to address another man, there are others who insist that the 28-year-old is aware of the offensive nature of the word when addressing an African-American male. McGregor and Mayweather are scheduled to engage in the final stop of their promotional world tour in London on Friday night.